The cascade is once again the pattern you use for juggling with odd numbers of objects. 7 Ball Juggling will be even faster and higher than your 5 ball Juggling which you should already have mastered. It isn’t essential that you have learned to juggle 6 balls before moving on to 7, (as even numbers use the fountain pattern. More details on this can be found on my Numbers Juggling page. In the 1990’s and before, there were hardly any people in the world capable of juggling 7 balls. Now that most people have access to the internet and can see what the world’s greatest jugglers are achieving, many people are able to realise that these tricks are not impossible, but that they do require an insane amount of hard work and dedication to master! All 7 ball jugglers will have their own useful tips for how they learned. Do some Google searches, watch some YouTube clips and ask the jugglers in person (or through an online juggling forum) for further advice. There are no hard and fast rules, although I would recommend one useful starting point would be to work your way through my 5 ball juggling page attempting to do everything with 7 balls! Remember that your throws will need to be even higher and much faster than ever before! To help you get the correct speed for your pattern, try a 5 ball flash fitting in some handclaps where the extra balls would go. Some people find it helpful to also be working on 8 balls (4 in each hand) also. This lets you get used to high numbers of balls in the air, and more height and speed than ever before! 7 Ball Flash: Try to throw all 7 balls up in the air and then catch them again for a clean finish. Now keep going! Lots of hard work and perseverance ahead of you, but you already know that from having learned 5 balls which at one time must have seemed unachievable! I thought it best to get some advice from someone who has used this page to help improve their skills and can now offer their own advice in addition. Thanks to Tristan Cox (Tristan Cox Website) for stepping forward and providing the following additional tips (he flashed a 7 Ball Cascade in April 2014, and sent in these tips while they were still fresh in his mind! “Don’t throw the balls too fast. Keep the same tempo and keep the throws at a constant speed. Also keep each throw to the same height. How I started to juggle seven was I threw the first throw higher than the others and as it came down to a seven ball hight I did a six ball crossing pattern. 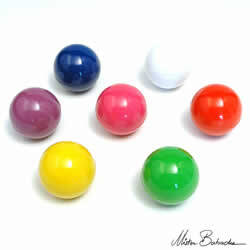 This may help to get at least five balls kept in the air so that each hand only has one ball in it. Another tip is to keep your hands parallel to the ground (do not turn them sideways to make throws). Here are some tips from Carl.